Tropical Cyclone ULA (TC ULA) was named by RSMC Nadi on December 30th, located around 500km northeast of Samoa. Since then, the cyclone has tracked between Samoa and Niue, past northern Tonga (where a state of emergency was declared) and on to the south and southwest of Fiji. In the last few days Ula turned northwest again, tracking towards southern Vanuatu. It has now begun to curve southwards. Historical track of TC ULA to 7 am Saturday, 9th January 2016. Image via NOAA Earth System Research Laboratory. 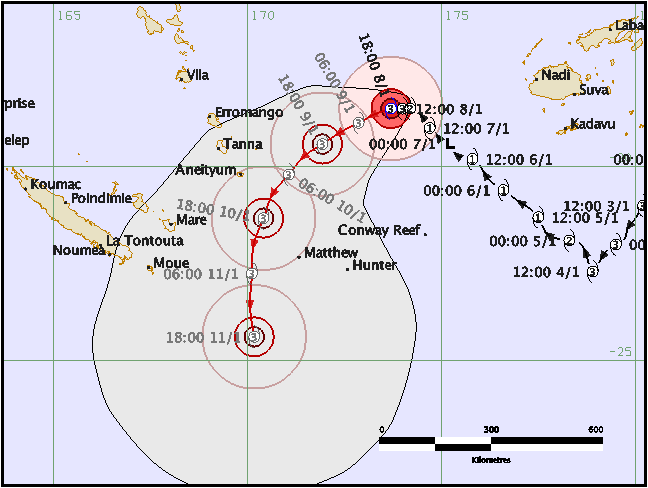 TC ULA was located midway between southern Vanuatu and Fiji at 7am today (Friday 9th January). The central pressure of the cyclone was estimated to be 970 hPa, making it a Category 3 cyclone, and it was moving to the west-southwest at approximately 4 km/h. Winds close to the centre of the cyclone were expected to be around 130 km/h. Satellite image showing the location of TC ULA at 8am, Saturday 9th January. TC ULA is expected to curve southwards over the next 24 hours, passing near the southernmost islands of Vanuatu on Sunday. This is shown in the forecast track map below. 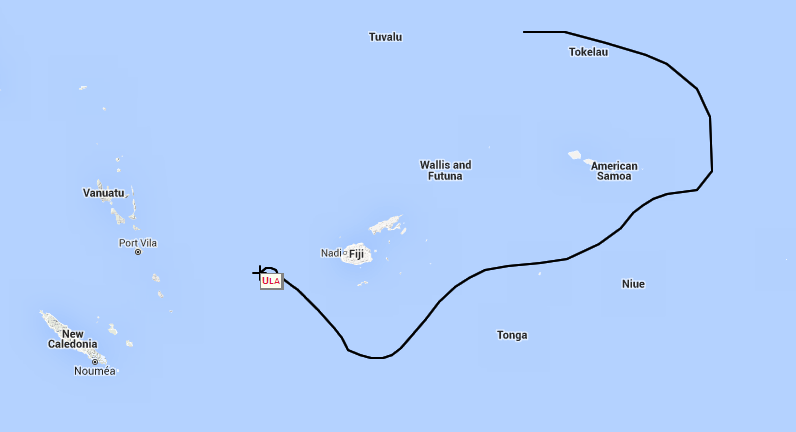 Forecast track of TC ULA produced by RSMC Nadi in Fiji, issued at 7am, 9th January. On Monday, TC ULA is expected to turn towards the southeast as it moves out of the tropics and towards waters to the north of New Zealand. 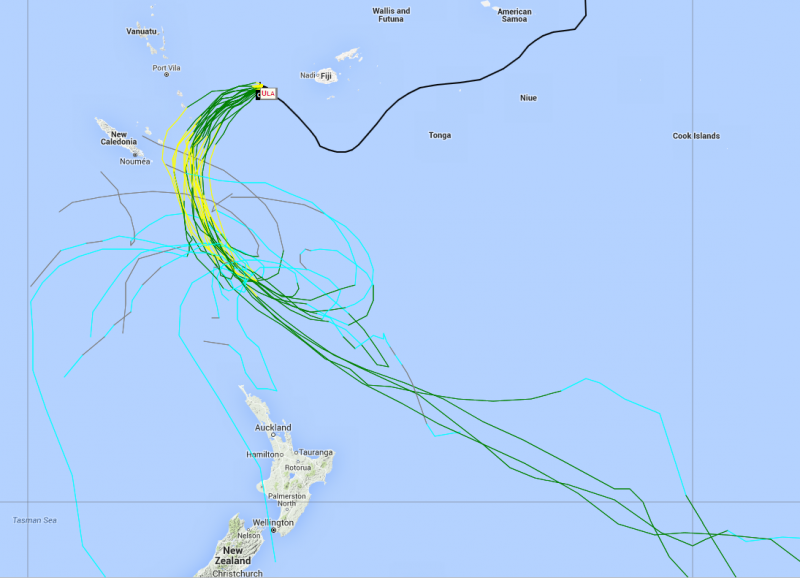 The eventual track of TC ULA is expected to take it past the north of the North Island during the middle of the week. The future track of the cyclone becomes much less certain in the latter half of the coming week. The graphic below shows a range of possible future tracks based on data supplied by NOAA. 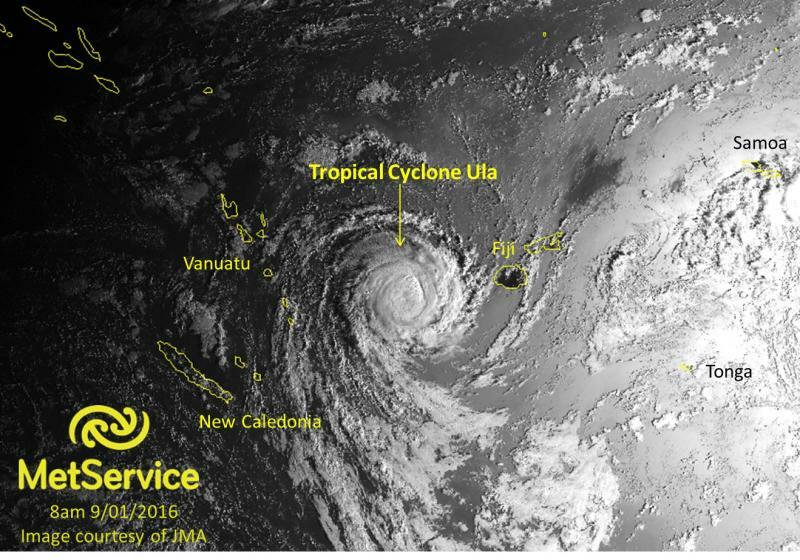 MetService meteorologists are monitoring TC ULA closely and provide tropical updates daily via our Tropical Cyclone Activity Page, where you can also see hourly satellite imagery. As the cyclone moves closer to New Zealand and over colder waters, it will lose its tropical cyclone characteristics and become more like a mid-latitude depression. 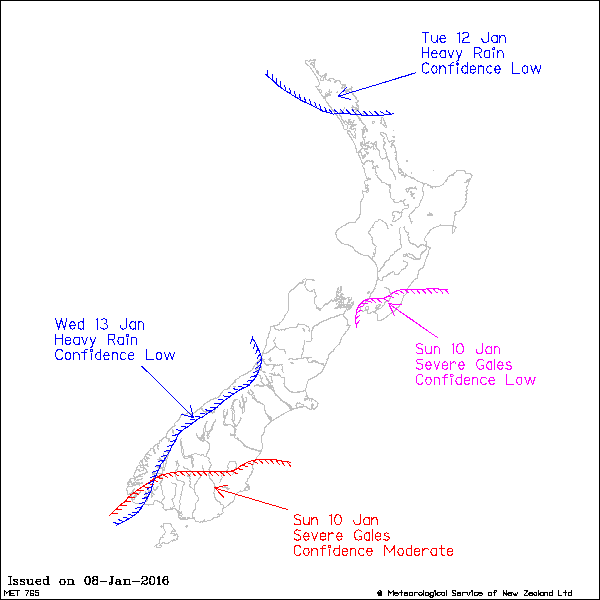 It is expected to pass offshore to the north of the North Island. The rainband associated with the former tropical cyclone may affect northern New Zealand, where there is a risk of heavy rain as shown in the latest Severe Weather Outlook below. We’ll post further updates on TC ULA in the coming days, and as always, you can keep up to date with the latest forecasts and warnings at metservice.com.